This week, I’ve been thinking again about transitions: how do we deal with change? How do we know when we’re ready for it? and how do we deal with it and incorporate it into our lives even if we’re not fully ready? It’s April vacation for my family, and we’re touring some colleges with Gabriel. The first stop was Columbia, where I was doing my graduate work when Gabriel was born, so coming back and doing a tour was like going full circle. At twenty-seven I was really excited to be a mom, but also not fully prepared for it. Motherhood made me rethink and re-orient myself to myself and to the world—it was a big and wonderful summersault. It was only after becoming a mother that I felt sure that I not only wanted to but needed to write: I needed to make sense of my own story, to put words to my own experiences. I moved to Cambridge the next year to work with Jorie Graham, a poet (and mother), whose work I loved. Now 17 years later, I’m feeling similarly grateful to writing as a place to make sense of my story and of the shifts in identity that happen just by living in time. While Simone is still only in sixth grade (she turns 13 this summer—a teenager! ), I’m very aware that I’m entering another chapter of my life—that we’re all moving towards new chapters. The name of my online course is Align Your story, but in some ways that is misleading. We don’t have just one story. We have countless stories, and those stories continue to change. Aligning our story is work that we need to continue to do throughout our lives. Who are we? Where do we come from? Where are we going? The answers to these questions continue to morph. Sometimes we think that we don’t have time for writing. But we are always living inside of stories. Sometimes those stories write us. We swim in them. We can’t always make sense of them. But if we can get comfortable in them, we can have a different orientation to our own lives—and to the lives of others. And I believe that this process of getting comfortable is not just something that we do in writing—but something that we do with our whole mind, body and spirit. We are always living in change—personal change, physical change, political change, global and environmental change. We are always living with forces bigger than ourselves. When we try to makes sense of these changes only with our mind—and with our left brain, which wants to control—we may become more lost. But when we can allow ourselves to enter into the space of creativity, where change is always happening, when we can drop into our bodies and quiet our mind, we can access a greater freedom and vivacity. I’ll be starting Align Your Story again on April 24th. I’d love for you to join me. It’s a ten week online course with reading, writing, lessons, yoga and meditation. There are weekly live optional conference calls and a private facebook group. You get plenty of support from me, but you can also go through at your own pace because once you enroll you have access to the course and community for life. Align Your Story was a much richer and more fulfilling experience, simply because there’s so many more resources and much more time. But taking the course didn’t just help me come back to my writing; it also restored a faith or belief that I hadn’t realized I’d lost—and that’s the belief in the possibility of transformation. I had had a lot of hard experiences in a really short period of time in my life. And I hadn’t recognized how those experiences had hardened me and even made me cynical about my own future. I felt like I was stuck and just spinning my wheels. 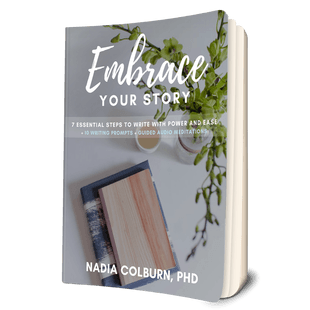 I know that working with Nadia through Align Your Story has been instrumental in moving beyond that phase in my life. (Read more at http://www.nadiacolburn.com/praise.html) —Tyler P.